Formax MailDoc™ is a powerful, easy-to-use software suite that generates Optical Mark Recognition (OMR), 1D and 2D Barcode Recognition (BCR) marks directly on documents for intelligent inserting of varying multi-page documents such as invoices and statements. MailDoc reduces printing and postage costs by sorting your unprinted documents and collating those that are intended for the same recipient so they are sent in the same envelope. Convert traditional simplex printed documents to duplex printing with MailDoc to reduce paper costs and provide additional postage savings. 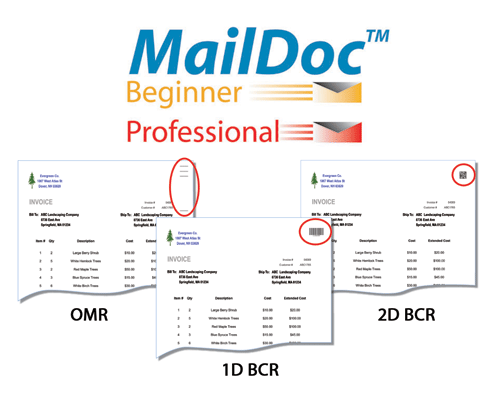 In addition, MailDoc allows you to fully utilize a Formax Inserter equipped with OMR or BCR through enhanced security of sequence check marks, target marketing with selective feeding and diverting of sets based on selected criteria. Adding electronic overlays with company logos, messages or borders can enhance your printed document image while eliminating the need to inventory pre-printed forms. The optional Postal Module further increases savings by running addresses through CASS, PAVE list management software with the use of NCOA for list certification.